After 39 years in business, Barbara Zeppos and Studio 890 Salons have emerged as a company employing the largest number of apprentices in the Mid-West. It was Barbara’s mission to mold her company into a highly respected teaching salon that would train individuals in the art of creative custom hair color and design. Here at Studio 890, we are very proud of the many successful hairdressers our company has to offer, and we welcome the opportunity to have you as part of our team. Studio 890 wants the best – and hires only the best! And we have high expectations! We are looking for individuals that understand the commitment that it takes to be a dedicated, hard working, reliable employee with strong work ethics. After careful review and upon your employment with Studio 890 – the State of Wisconsin issues an apprentice contract between you and Studio 890. The Apprenticeship Program consists of two parts – theory instruction and practical training. 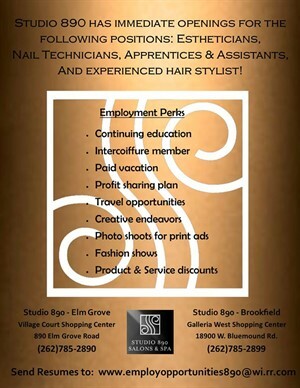 Studio 890 Salons have partnered with M.A.T.C to provide you with the training you will need to become a successful hairdresser in one of today’s fastest growing service industries. 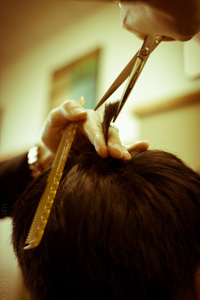 The Assistance Program - this program is a great way to start your career after graduating beauty school. This program is six months of advanced training done in house with our talented staff, we also offer additional education by sending our employees to many different academies, Bumble and Bumble, Goldwell just to name a few. Studio 890 is always looking for talented, outgoing friendly people to join our team. Thank you for your interest in our salons. We hope that the information provided to you will help in your decision to pursue an exciting new career opportunity.